Oven Baked Fish | Ginger Lime Whiting! There are only so many protein bars, shakes and desserts you can eat until you need a wholesome, filling meal, and this Oven Baked Fish is just that! Matthew made this dinner on a whim one night and it was flavorful, tender and extremely filling. As simple as it is, we knew this was a recipe that needed to be shared because sometimes the simpler things in life are just better. Also, this recipe begins our house warming series as we start new in Atlanta! For this recipe we decided to go with Whiting fish for sustainability reasons. Overall, we've been trying to up our meat, fish, egg and butter game! However, don't let this stop you from using any fish you prefer or have at home. Other great options are cod, tilapia, orange roughy and mahi mahi! You could even swap the lime out for lemon. If I can be honest for a moment, it wasn't until this year that I actually started cooking and really loving fish! I had been missing out for the first 27 years of my life, not only in terms of taste, but in how easy fish can be to prepare. Pan searing and baking are equally easy because fish cooks relatively fast. So, you're also eating a lot quicker! One of my favorite methods of cooking thinner filets of fish is just by broiling it for 5-6 minutes in the oven. This recipe is the first of our house warming series where we show you the meals we eat on any given week night. A couple of our other favorite week night meals to prep are keto chili and crispy chicken thighs! We have been going to fish a lot more lately since it's really quick to make and acts as a great base for flavors and toppings. Although it's still early on in the series, I have to say this Oven Baked Fish recipe might just be my favorite for its fresh feel and flavor packed bites! Note: We used fresh ginger and garlic in this recipe, but feel free to use the powder forms if that is what you have on hand. You would replace the fresh garlic with 1/2 tsp garlic powder and the fresh ginger with 3/4 tsp ginger powder. Note: To up the fat on this meal you can finish it off with a drizzle of olive oil! 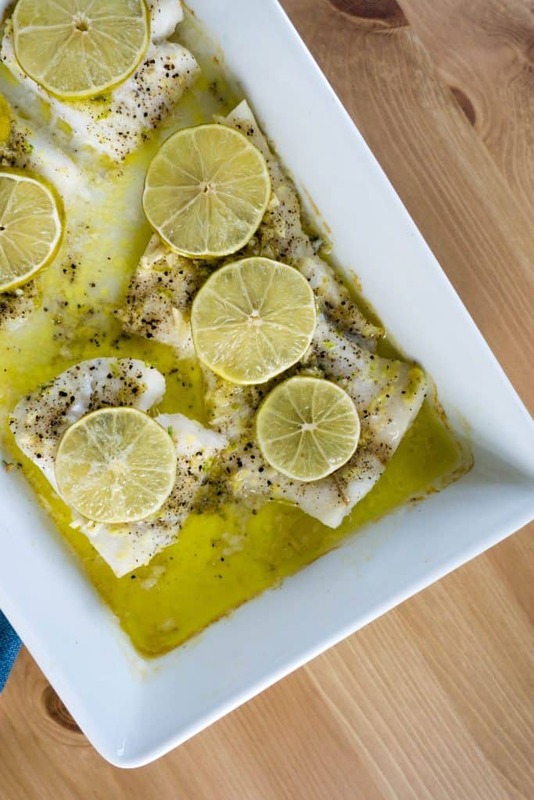 Recipe can be quickly added to MyFitnessPal - Search "KetoConnect - Ginger Lime Whiting"
Oven Baked Fish | Garlic Lime Whiting! Place your whiting in the bottom of your baking pan in a flat layer. Layer the minced garlic and grated ginger onto the fish. Grate the zest of an entire lime on the fish and season with onion powder, salt and black pepper. Slice the lime into thin slices and layer the fish with the lime slices (as many or as little as you want). Finally, chop the butter into chunks and top the fish. Place the fish into a 350 degree oven for 20 minutes. Serve immediately or store in a seal-able container in the fridge up to 3 days.